Possible that im the only human that does not work that is awake at this time of night sitting in the dark cause my brother in laws asleep on the couch! Going to bed excited cause i get to see the new harry potter movie tomorrow! Sitting here packing a bag so i can stay the night with my sister in law and the baby tonight! Thanks she is deffently a cutie! Going to help my Sister in law give birth to my beautiful new niece wish me luck! All fixed thats the only title i could think of! Thanks for your help. 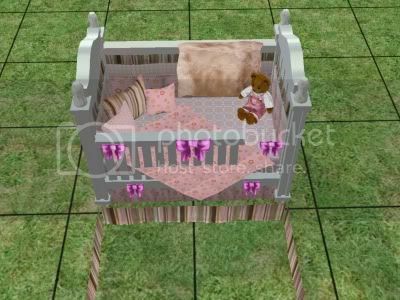 I found a set awhile ago for baby and toddlers it was a decorative blanket three pillows all together a dust ruffle and teddy bear to sit on the bed and bows.It came in light blue and light pink! I would like this set and if anyone knows of any recolors i would like to have them too> thank you for all your help! Im sitting at home debating what should i eat! Im sitting here still trying to beat kingdom hearts 2 and talking with my friend becky! we have 3 Sheba is 7 snowball her son is 5 and then my baby sammie hes my boy and hes about a year old. Sorry to hear about your cat ! I am currently going to bed ! Night to All!